There is a number of writers and visionaries extolling the coming prosperity and the reason is due in large part to a new wave of entrepreneurs. In years and decades past we had cheap, overseas labor and large-scale economies with tremendous buying efficiencies. A rising middle-class in lesser-developed countries fueled the demand in many cases. Despite current world economic problems, including some dooms-day prophesies, a big part of this impending economic turn-around is the result of low-priced and wide-spread technologies that connect individuals with a wealth of knowledge and information. Entrepreneurial ideas, innovations and inventions will result in a better world as new products and services come to market. New products and services, of course, will result in more freight. And there already is a renewed demand for newer and better facilities for order fulfillment and product distribution. Take, for example, the Panama Canal expansion which is due to open very soon if it is not open as you read this. The increased throughput in this water way is actually forcing our nation’s port gateways to make the necessary structural improvements to reduce congestion and productivity losses. Miami is the closest port to be affected by the new Panama Canal and is expecting to double its cargo traffic over the next several years. All of these increased structural demands help facilitate hundreds of thousands of direct and indirect jobs in their affected areas. 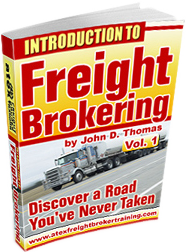 If you are ready to become a valuable part in these gigantic industries working as a freight broker, go here to sign up: Click here to select training over the Telephone & Internet. Let’s take another example that relates to the “low-priced and wide-spread technologies” mentioned above. Ecommerce activity is radically changing the way retailers do business. Internet sales are moving from 20% of total sales to 50% for some retailers. Greater efficiencies are needed in materials handling. One retailer can pick and package an item in as little as 18 minutes. That item can be on a truck in 2 hours after an online order is placed. As you can see, this wave of entrepreneurship will create a flourish of activity and affect millions of individuals including an increased demand for good freight brokers. Shippers rely upon freight brokers to save time and money. Can you imagine a shipping manager spending his or her day searching for trucks for all their loads? Once potential trucks are found, it is not likely that shipping managers want to spend a lot of time negotiating rates. They have a busy enough schedule otherwise. Not all shippers use freight brokers; but when they do, they find that the broker’s services do indeed save time, money and effort. These are powerful incentives for shippers to use brokers; and they are powerful incentives for brokers to learn how to do all this. Again, the world will be offering a host of opportunities in the freight, logistics, trucking, supply chain and freight broker areas. Don’t pass opportunity by. Take control of your destiny and build the financial independence you desire.